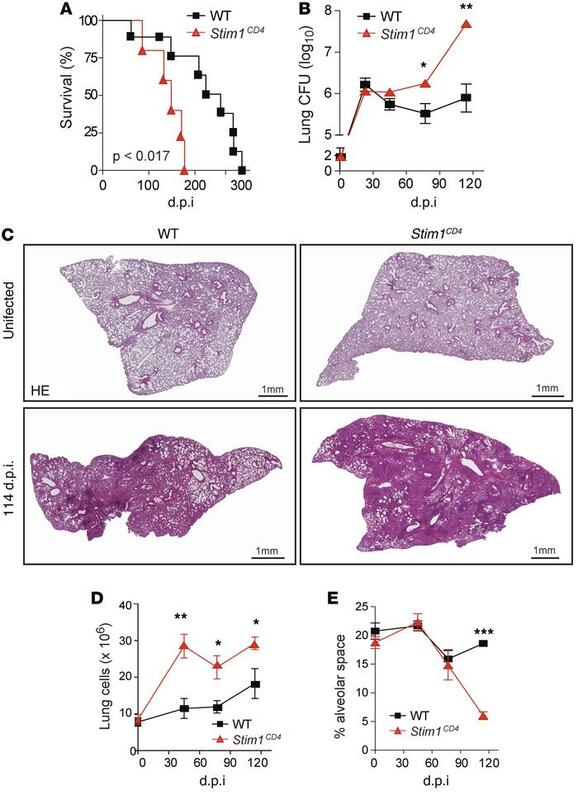 STIM1 in T cells is required to control chronic Mtb infection in mice. (A and B) Survival curves (A) and lung bacterial burden (B) of Stim1CD4 and WT control mice infected with 100 CFU of aerosolized Mtb strain H37Rv. Results are representative of 3 independent experiments. (C) H&E stains of lung sections at 114 d.p.i. Pictures are representative of 5 mice per group. Original magnification, ×40. (D) Averaged total numbers of live cells isolated from the lungs of 3 to 5 mice per group and time point. (E) Open alveolar spaces quantified from histological sections in part C of 4–5 mice per group and time point using ImageJ software. Statistical significance was calculated by Student’s t test. *P < 0.05; **P < 0.01; ***P < 0.001.